The players of Mlada Boleslav deserved to win this impressive football performance, levelling Ostrava and keeping in touch with the top teams of Gambrinus League. They succeeded in giving a really a worthy cheerio to their fans, as it was the last league home match in 2009. The first half witnessed a lively game with opportunities for strikers in front of both goals. Mlada Boleslav enjoyed the match. 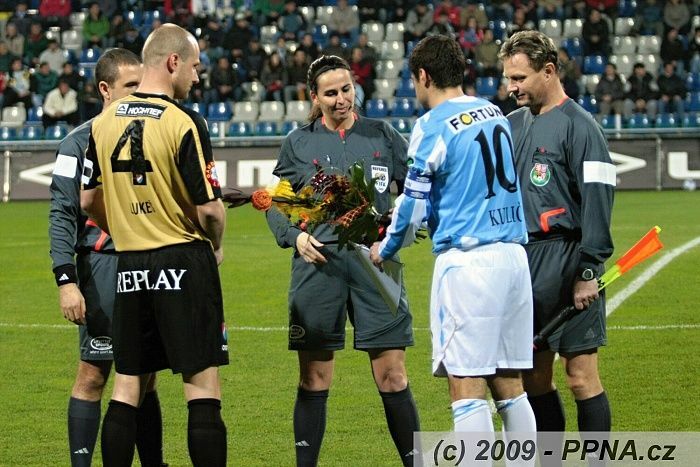 Polacek and Mendy, and Fabian and Kalina took turns in harassing the Ostrava defense. After Bolf tripped the onrushing Kalina in the 10th minute, Taborsky saw his resulting penalty kick gratefully accepted by the embrace of the goalkeeper Baranek. Miller then turned a well taken shot from Reznik around his right goalpost for a corner in the 14th minute. Mlada Boleslav were on the attack again in the 15th minute with Taborsky leading the way. His final attempt at goal was far from clinical but it saw a defending player throw out his hand and the referee Damkova whistled for a penalty kick without hesitation. Sylvestre's execution was calm and he sent the ball low inside the right upright - 1:0. Mlada Boleslav enjoyed their lead for about three minutes. Strnad's cross from the left wing was swept away for corner by Prochazka, and after a toughly contested ball into the box found its way to an unattended Bolf who directed his header inside Miller's left hand post - 1:1. Both teams tried hard to push into opposition territory but Mlada Boleslav was more successful in their endeavor. In the last 10 minutes of the first half Taborsky and Kulic both found themselves in good shooting positions but could not make them count. Mendy also failed to hit the target after a clever ball in from Fabian. The first half was drawing to a close but the final minute of overtime saw a beautiful pass from Rajnoch put Kulic clear on goal, but he could only manage to drive his effort into the legs of Baranek. Rajnoch tried to turn the rebound into the net, but Neuwirth did not have too much work to do to thwart the attempt. The pace of the game continued in the second half, and to the great satisfaction of the almost full stands Mlada Boleslav scored two winning goals. Baranek blocked Mendy's cannon shot in the 59th minute, and three minutes later Rajnoch passed nicely to Kulic, who escaped Bolf and passed to Taborsky, but unfortunately Neuwirth again prevented him from finishing the task. Polacek played a textbook pass to Necas in the 73rd minute, and his grounded pass was dispatched with certainty by the league's best shooter Kulic for a deserved lead - 2:1. Fabian soon centred another enticing ball across the box however this time Bolf was ready to stop the danger. Fifteen minutes before time saw Ostrava push for an equaliser as Varadi rushed past the Mlada Boleslav defense unguarded, but his shot on goal missed the target across the oncoming Miller. Ostrava were growing ever bolder and continuously tried to penetrate the well-arranged defence of their rivals. However, what Rolk, Prochazka, Fabian and Kalina did not kick or head away, Miller was on hand to collect. Five minutes before the final whistle, Necas took on and beat his defender and played a cross into the box from the left hand wing but it was forced across the goal line for a corner in front of the waiting Kulic. Polacek's subsequent corner found the head of Rajnoch and he guided the ball inside the right hand post for their third goal of the afternoon - 3:1. Mlada Boleslav spectators applauded the end of the game, and the fans from Ostrava sang their chants. Football of above-average quality and an excellent atmosphere ended in the deserved victory of Mlada Boleslav. Line-up of FK Mladá Boleslav: Miller - Kalina, Rolko, Procházka, Fabián (79. Kúdela) - Mendy, Sylvestre, Rajnoch, Poláček - Kulič (84. Bořil), Táborský (71. Nečas). Janíček, Pecka, Opiela and Šeda were unused substitutes. Line-up of FC Baník Ostrava: Baránek - Řezník, Neuwirth, Bolf, Tchuř (25.Zawada) - Mičola, Lička (78. Wojnar), Lukeš, Marek - Zeher (61. Varadi), Strnad. 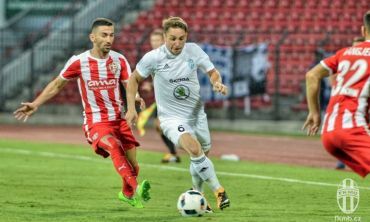 Hable, Kraut, Tomašáki and Buček were unused substitutes.